The Partners and staff at Perth Radiological Clinic want to take this opportunity to thank retiring Partner Dr Ros Thomson for her wonderful years of service to the Practice.Ros moved to Perth and joined PRC in 1983, following appointments at the Whittington and Royal Northern Hospitals, London, The Royal Children’s Hospital, Melbourne and the Tung Wah Hospital in Hong Kong. She became a Partner in 1987. As a specialist paediatric radiologist Ros also worked at Princess Margaret Hospital including a stint as Acting Head of the Radiology Department from 1986-1988. Ros was a highly regarded member within the local paediatric radiology community and the care she showed for her young patients and their parents was exemplary. She was a pleasure to work with and will be dearly missed by her colleagues and staff. 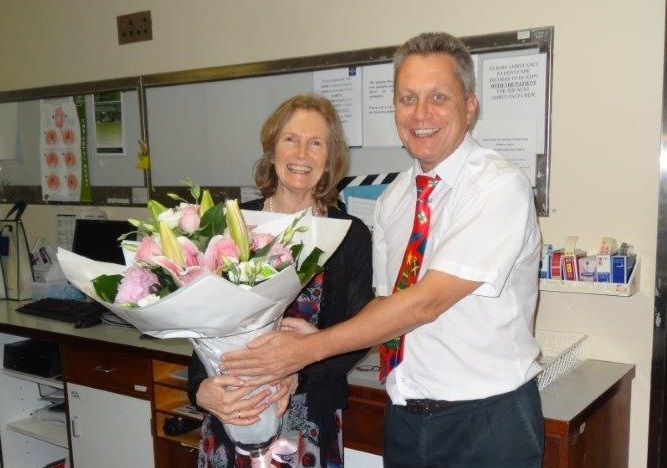 Pictured above is PRC Chairman Dr Martin Blake farewelling Dr Ros Thomson. We wish her a long, happy and fulfilling retirement.